The national player of the year in 2015 at Lake Stevens High School, Jacob Eason is reported ready to transfer from Georgia to the University of Washington. QB Jacob Eason, the 2015 national prep player of the year from Lake Stevens High School who lost to injury his starting job at Georgia, is heading back home to play at the University of Washington. Anonymous sources told the Seattle Times Tuesday that the 6-foot-5 sophomore, replaced by freshman Jake Fromm, who took the Bulldogs to the national title game Monday night in Atlanta, will transfer and, per NCAA rules, be eligible to play in 2019 after sitting out 2018. 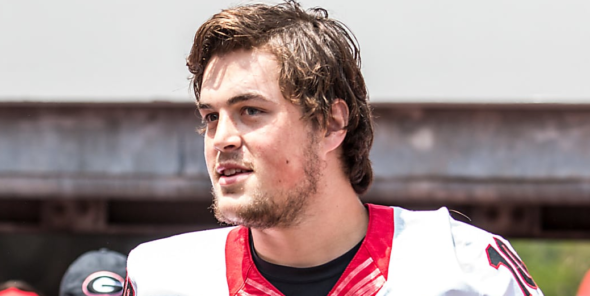 Eason, who was 204-for-370 passing for 2,430 yards, 16 touchdowns and eight interceptions as Georgia’s starter in his freshman season of 2016, was booked to start again this fall until he sprained his left knee in the season opener. Fromm took over and led the Bulldogs to the SEC championship and a berth in the College Football Playoff semifinals, where they beat Oklahoma in the Rose Bowl to advance to the finals. But Fromm and the Bulldogs, up 13-0 at the half, were mostly shut down thereafter by the defense of the Crimson Tide, which switched quarterbacks at intermission and rode the passing of freshman Tua Tagovailoa to the win. Eason was recruited heavily by UW but had made an oral commitment to Georgia well before signing day. After his knee healed, the coaches stuck with Fromm, and the results underscored their decision. Offensive coordinator Jim Chaney told reporters that he was impressed with Eason’s cooperation. The Huskies are set at quarterback in 2018 when Jake Browning returns for his senior season. But UW signed two premier recruits, Jacob Sirmon (6-4, 227, Bothell) and Colson Yankoff (6-4, 204, Hayden, ID.) during national letter day last month. Both were considered among the top 100 recruits nationally, and both began their first classes at UW last week. The Huskies have two young quarterbacks, redshirt freshman Jake Haener (6-0, 193, Danville, CA.) and Daniel Bridge-Gadd (6-2, 199, Phoenix), on the roster, as well as an oral commitment for the class of 2019 from Dylan Morris (6-1, 195) of Graham-Kapowsin High in Pierce County. Ok..well, it looks like the Huskies are loaded at QB! The competition will be tough so probably one or two of them will move on?